Irrigating the blueberry beds and spraying some neem oil on the aphid infested grapes was the perfect activity to listen to an audio book through one earbud. A note on the aphids before I proceed: I just ordered a few thousand lady bugs from amazon of all places. As I finished spraying the grape vines, a movement caught the periphery of my vision. 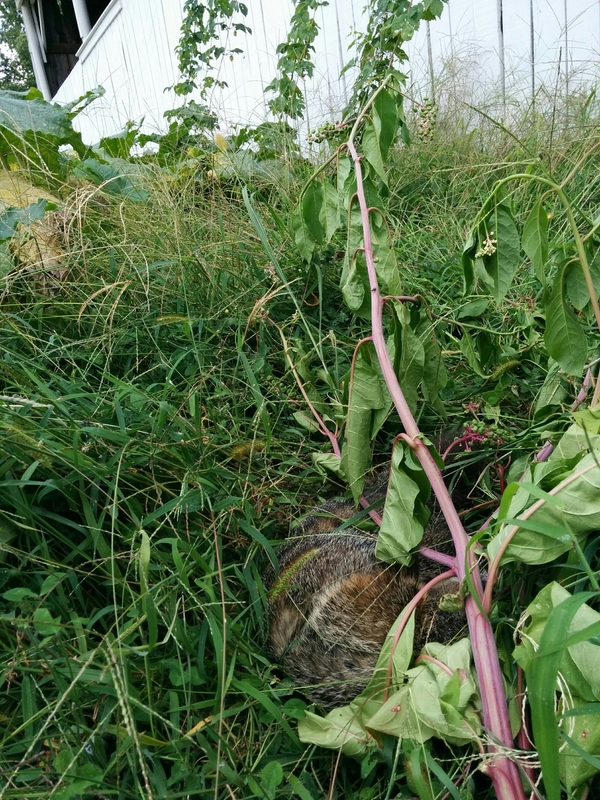 A ground hog had stood on its hind legs not more than 20 feet away and proceeded to rip a hop cone from the vine climbing the trellis in front of the barn. Strangely enough, the audiobook playing into my ear was at one of the most infamously morbid scenes in modern literature and more recently, one of the most shocking scenes of television (book 3 of A song of Ice and Fire, Game of Thrones on TV). 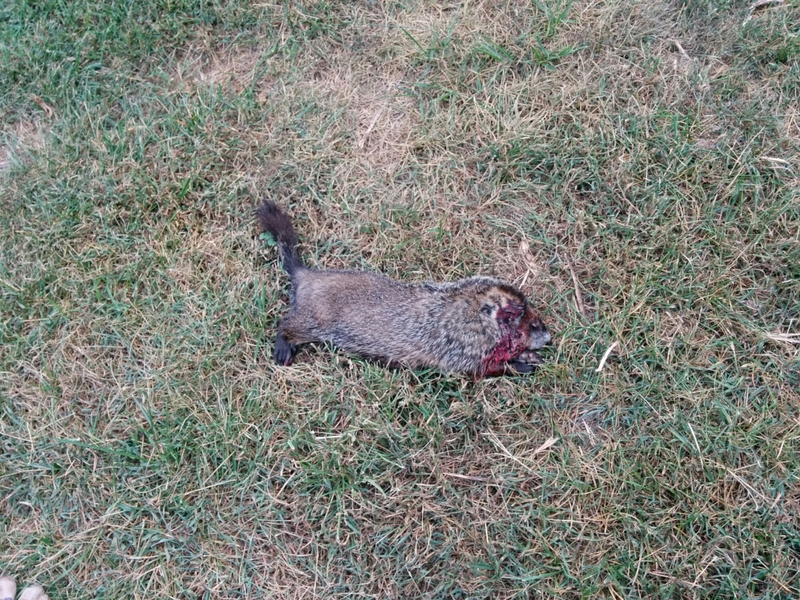 My exit from the garden to retrieve my rifle alerted the large rodent to my presence. When I returned, I set up near where the pest was last sighted. A sharp whistle from my mouth appealed to the natural alarm signal used by groundhogs to alert their neighbors causing it to stand on its hind legs momentarily. Had I taken a shot, the barn wall was the backdrop with equipment and fuel tanks on the other side of the wall. Maneuvering uphill and backtracking into a position where earth, and admittedly a large pumpkin, served as the backdrop, I whistled again. This time with the rifle ready, I was able to deliver a shot that instantly killed the woodchuck when she stood up above the pumpkin foliage. This is definitely more graphic than my typical content. The main goal of this blog is to give an unfiltered view of what the efforts of starting a farmstead entail. Thus all my mistakes, shortcomings, failures and addressing pest issues are to be documented to serve as a learning experience for others and to provide reflection on my end to improve my approach. Regardless, this is my least favorite aspect of the whole project. Ground hogs are beautiful creatures and help cycle the soil when they dig their burrows deep into the ground. Unfortunately for this whistle pig, she foraged the single off limits acre out of 30 requiring action on my part. Hopefully this is the last one I will have to eliminate.